"I'm so sad to hear of the passing of Sister Theresa, who..."
"My deepest sympathy to Sr. Ruth and Sr. Theresa's family. ..."
" I had the privilege of teaching with this wonderful..."
"Oh how lucky our family was when mom got to live at Howell..."
PORTLAND – Sister Shirley Theresa Conlogue, R.S.M., (aka Sr. Mary Terence) 85, died peacefully at St. Catherine's Residence surrounded by her Mercy community, family and friends on Monday, Nov. 26, 2018. Sister Theresa was born in Houlton, Maine on April 17, 1933, the fourth of seven children in the Edward and Mary Allison Conlogue family. Following her elementary education at St. Mary's School, Houlton, she graduated from St. Joseph's Academy, Portland, in 1951 and entered the Sisters of Mercy, Portland in September, 1951, and professed her final vows in 1957 as Sister Mary Terence. She prepared for her teaching ministry at St. Joseph's College with the BS in Elementary Education. For 47 years Sister excelled as a primary teacher in these diocesan parish schools: Cathedral, Portland; Holy Cross, South Portland; St. Athanasius, Rumford; Immaculate Heart of Mary, Fairfield; St. John's and St. Mary's, Bangor; St. Mary's, Houlton; and St. Mary's, Augusta (1976 - 1983 and 1994 - 2002). In 1994, Sister Theresa was presented with the National Catholic Elementary Schools Distinguished Graduate Award in recognition of her ten years of devoted service to St. Mary's School and St. Mary's Parish in her hometown, Houlton. Sister retired from education and parish ministry in 2002, and returned to Augusta where she served for eight years as Resident Services Director at the Howell House, a parish congregate assisted living facility. She was fond of saying that "St. Mary's, Augusta, will always hold a special place in my heart." Upon retirement from her ministry at Howell House, Sister Theresa moved to Portland, where she continued a ministry of prayer and presence to her Sisters in the community and to those whom she had known throughout her years of ministry. While teaching, Sister Theresa also served many years as superior or treasurer for her Sisters. Her practical nature, lighthearted approach to life, and homemaking skills made her a much appreciated member of the Mercy community. Sister Theresa was predeceased by her parents; and sisters, Bette Grant, and Marie Stine. She is survived by her sisters, Joan Lanzone of Long Beach, Calif., Jeanette and husband Malcom Hamilton, Windsor Locks of Connecticut; her brother, Eugene "Connie" Conlogue and wife Joyce of Phoenix, Ore.; Sister Ruth Conlogue, RSM, her devoted caregiver through recent years of health complications; as well as many nieces, nephews, grand nieces and nephews. This past summer the Conlogues enjoyed a grand reunion to celebrate their large extended family. The Sisters of Mercy, particularly those living with Sisters Theresa and Ruth at St. Catherine's, have been enriched by her prayerfulness, courage and warm love for all. Although she endured much physical suffering, she faced her declining health bravely, and tried to adjust to her changing circumstances. The Sisters of Mercy are grateful for the care Sister Theresa received at Mercy Hospital and the care given by VNA Home Health and Hospice teams during the years of her declining health. Visiting hours will be held on Friday, Nov. 30, 2018, from 3 p.m. - 6:30 p.m. with a 6 p.m. Prayer Service at the Conroy-Tully Walker South Portland Chapel, 1024 Broadway, South Portland. A Mass of Christian Burial will be celebrated Saturday, Dec. 1, 2018, at 10 a.m. at St. Pius X Church, 492 Ocean Ave., Portland. Burial will follow at New Calvary Cemetery, South Portland. 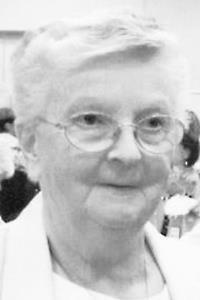 To view Sister Theresa's memorial page, or to share an online condolence, please visit www.ConroyTullyWalker.com.